Las Vegas outdoor weddings - you can get married at Grand Canyon, Valley of Fire, the beach, have a simple outdoor gazebo or garden, Neon Boneyard, golf course, and so many other venues! Explore these unique outdoor wedding destinations in and around Las Vegas below! Grand Canyon Helicopter Weddings allow you to celebrate your special day at one of the most beautiful natural wonders in the world- the Grand Canyon. Step aboard a luxury helicopter and fly high over Las Vegas, Hoover Dam and Lake Mead before landing on a beautiful bluff in Grand Canyon. This type of Las Vegas outdoor weddings is perfect for nature lovers because it will provide them a breathtaking location for wedding photographs and a wedding they'll never forget. Couples get to say "I do" in this majestic setting either in day time or in the evening while they enjoy a beautiful sunset over Grand Canyon. Saying your wedding vows as you soar high up in the air with the dazzling, twinkling lights of Las Vegas Strip under you is definitely one of the coolest and the most special ways to get married for a couple. Helicopter weddings are unique because you'll be aboard a private luxury helicopter that will take you high up in the sky. A minister on board will marry you as you enjoy the gorgeous view of the Strip under your feet. 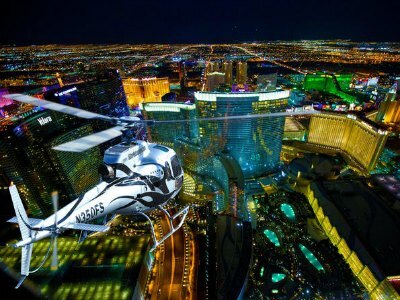 Although helicopter weddings would not allow you to have many guests on board to witness the wedding, it is definitely a spectacular idea for Las Vegas outdoor weddings. The Valley of Fire is named so because of its beautiful red sandstone cliffs formed millions of years ago. Today, this location is one of the most popular Las Vegas outdoor weddings for couples because of the fiery red rocks in the valley that proves to be a beautiful setting to get married near Las Vegas. The Valley of Fire is particularly popular with couples because it offers unbelievable views and an amazing backdrop for wedding photographs at any time of the day. Plan an early morning wedding to watch the sun rising over the valley or exchange your vows with the sunset in the background. Couples looking for a unique way to celebrate their wedding will find the Red Rock Canyon a spectacular place to get married. The site offers a beautiful panoramic backdrop of impressive red rocks and a desert landscape that is spectacular for photography. Located not far from Las Vegas, this site is close enough to the city but still manages to look remote. The Red Rock Canyon has become a very popular venue for Las Vegas outdoor weddings. Most wedding packages include limousine pick up and drop off service from the hotel along with everything needed for a memorable wedding. Located not too far from Las Vegas, Nelson Ghost Town is a dream destination for photographers because of its deserted landscape, old barns, rusted vehicles, old fashion saloon and the crashed plane left over from a movie shoot. While it is an unconventional location for weddings, it is still a very popular option for couples that want a very unique and fun Las Vegas outdoor wedding. The location transports couples back hundreds of years to the time of miners and prospectors that came to find gold. Indoors and outdoors, Nelson Ghost Town offers many cool wedding photograph opportunities and with every little detail taken care of, it will be a place where couples can truly enjoy the ceremony. 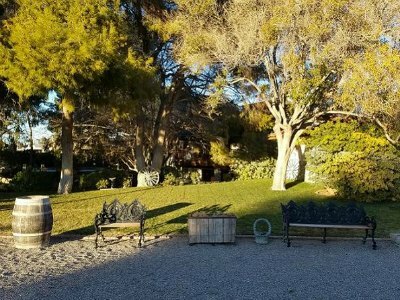 One of the more intimate Las Vegas outdoor weddings that you can offer your loved one is an Outdoor Wedding Ceremony at a Private Rustic Ranch in Las Vegas by Limousine. The park like landscape within the private rustic ranch is filled with love and unique adornments that will leave lasting memories for years to come. You will enjoy watching the complimentary DVD of the ceremonies as you stroll down the lush garden pathway that is filled with blooming flowers. The private rustic ranch is perfect for ceremonies of less than 15 guests and you can be assured of privacy is this intimate Garden of Eden. A bonus to this ceremonial package is a complimentary champagne toast and round trip transportation to and from the ranch in a luxury limousine. One of the more unique places to have your Las Vegas outdoor wedding is high in sky while you are riding the High Roller. Located at the Linq Promenade this is an ideal setting for up to 40 guests when you are ready to tie the knot. The High Roller will thrill everyone as you reach heights of 550-feet above the Las Vegas and witness incredible 360 degree panoramic views of the Strip and surrounding landscape of the Mojave Desert. You can choose this unique ceremonial setting during the day or witness the bright lights of Las Vegas in the evening. There are three love filled packages you can choose from that bring value and lasting memories to your wedding as well as putting a smile on every guests face. One of the most recognized and iconic site in the Sin City is the famous "Welcome to Fabulous Las Vegas" sign. For couples who truly love Vegas, there could be no better place to get married than at this famous landmark. 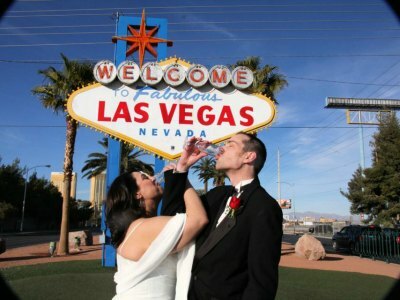 Couples from around the world choose to renew their wedding vows or get married at this location because it is an exciting gateway to Sin City. You'd be able to get married at this location and have everything arranged for you so you wouldn't have to stress about the details but simply enjoy your beautiful Las Vegas outdoor wedding. The Resort on Mount Charleston offers beautiful outdoor Las Vegas outdoor weddings for couples looking for a serene landscape. Located only 30 minutes away from Downtown Vegas, couples can tie the knot in a gorgeous mountain retreat. The resort offers the services of wedding specialists so you can enjoy the day instead of taking care of small details. Couples can choose from an intimate wedding with up to 5 guests or go with an elaborate, classic wedding with as many as 75 guests. Suites and guest rooms are also available on site so the bride and groom can enjoy a few blissful days enjoying each other's company after the wedding. Lake Mead Cruises offers couples full service packages that include everything you would need for a memorable Las Vegas outdoor wedding. From intimate ceremonies to large receptions, this location offers a lot of options to choose from. The Landing is a large wedding venue with a patio overlooking Lake Mead and the mountains. It can accommodate as many as 500 guests. 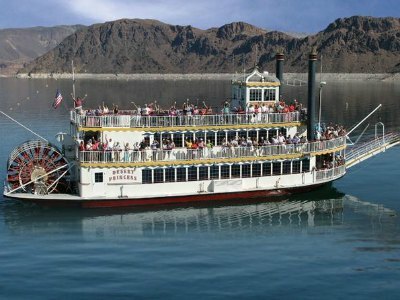 For a private charter, The Desert Princess is a charming paddle-wheeler, ideal for 200 guests. With enclosed as well as open decks, this paddle-wheeler is great for couples who want to tie the knot out on the water on an open deck. The Neon Boneyard is a massive property spread over two acres with a very unique curated collection of some of the most legendary architectural landmarks of Las Vegas. The location is a photographer's dream and now an equally popular venue for Las Vegas outdoor weddings. For couples who want a quintessential Vegas experience for their wedding, the Neon Boneyard offers a vintage venue with a touch of contemporary flair. The neon signage collection here is the largest in the world and is a great location for couples to tie the knot and revel in the colorful history of Las Vegas. The venue offers good amenities and several different packages to choose from. The Springs Preserve is a very unique biological and cultural preserve in Nevada. 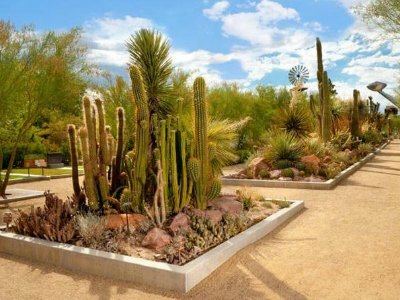 It is also a very memorable and tranquil location for Las Vegas outdoor weddings. Known for its sustainable and green practices, all weddings at the Spring Preserve are planned with "green" in mind. With 180 acres of nature trails, botanical gardens, museums and galleries, couples have plenty of different wedding venues to choose from. The Spring Preserve can accommodate anywhere from 50 to 350 guests in one of its 6 wedding venues. Options available at this venue include the Courtyard Rotunda, Gardens Amphitheater, Gardens Arboretum, Courtyard Plaza, Banquet Room and Springs Amphitheater. This location offers indoor as well as outdoor wedding. The Grove is a very unique and private wedding venue in Las Vegas. Away from the city's neon lights, this venue offers a private sanctuary where couples can get married in peaceful, elegant and beautiful natural surroundings. The Grove offers a number of different options, indoors as well as outdoors, to choose from. 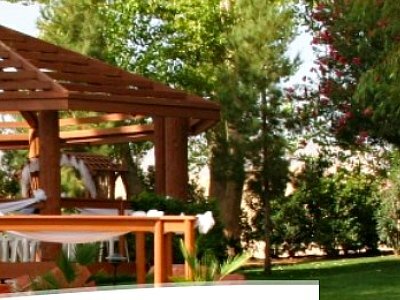 Couples that are looking for elegant and classy Las Vegas outdoor weddings will love the spectacular green lawns, old fashioned gazebo, mature trees and water feature. The Almond Orchard venue is especially breathtaking because it features a large expanse of almond trees and beautiful green lawns.